I love pouring over Sarah Jane’s Blog. If you haven’t heard of her, she makes the sweetest illustrations. 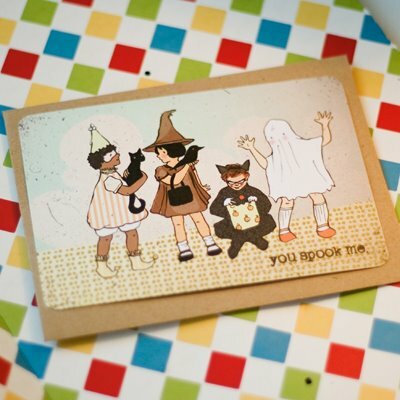 She has created some very cute cards for Halloween, the “You Spook Me” series are in her Etsy shop. Her work is just whimsical, adorable, bright and happy! She is someone who inspires me and gives me hope in that she has worked hard on her own, starting small and through Etsy and her Blog she is now recognized worldwide. I am not looking to get recognized worldwide, I am just aiming to pay the bills by doing something that makes me happy. My next goal is to start selling on Etsy, I think it would be a real opener to more opportunities for me. I read an article recently in Country Living and the woman who wrote the article, Katy McColl, has also written a book entitled: “Should I do what I love? (or do what I do, so I can do what I love on the side)”. The title alone made me smile, I have stopped being in the rat race and although I have been looking devoutly for a job in the Art world, I am continuing on this path that feels right as things continue to fall into place on my road to happiness. I am doing the best that I can do with what I have and that is all you can really ask of yourself. This entry was posted in Life and tagged country living, creative, cute, etsy, halloween, happiness, Katy McColl, Sarah Jane, Sarah Jane Studios, whimsical on October 11, 2009 by jennifermichie.